On the morning of October 4th, 2016 devastation hit southern Haiti in the form of a category four hurricane. Hurricane Matthew affected the lives of roughly 1.125 million people and I got to meet some of them. This past week I had the opportunity alongside a group of eleven people to go into the village of Baissin Caiman and it’s surrounding towns to learn how the people are living just four months later. Our team was able to survey about 70 homes throughout three different communities. As we walked by foot for miles on end what I saw was overwhelming. I saw pieces of land where homes once stood. I saw people in need of medical attention, children crying for parents and houses that consisted only of roofs. In America, we like to throw around the word “poverty” and we often define it as being poor; living below a comfortable or normal level of society. My journey through these villages drastically changed my perspective of living in poverty. In America, most people living in poverty receive some form of government assistance whether it is S.N.A.P (supplementary nutritional assistance program) benefit, unemployment benefits, Child Care Assistance Programs and much more. However, the people in these villages are lucky if they are even noticed by their local politician. Any government assistance program would be a huge step in the right direction. These people live and thrive off the land around them. Their homes are built from a clay-based paste. Their roofs are often thatch and the homes are not strong enough to withstand a minor storm. They work for months, even years to get enough money to build only one part of their home. Their lives are constant work. They must start a fire anytime something needs to be warmed. They must walk for hours to reach an outdoor market. Their water is retrieved from a well if they’re lucky. And yet, with this entire struggle the people of Bassin Cammin are strong and persevere. What I was able to witness are homes that were once completely destroyed, rebuilt to meet temporary needs. I saw people who had not lost hope. I saw families who remained strong and supported each other through devastating moments. I was able to witness the light of Christ strongly present among these people. As a social work student, I come in contact with people who are considered poor on a daily basis. These people have homes, they have food, they even have electricity. They are considered poor because they are not making a sufficient income. However, being in Haiti I was able to realize what being poor really looks like. These people have no assistance programs, no electricity, no place to get food when they run out. Yet they continue to live and thrive. They are a community unlike any other. They are strong and do not give up hope. 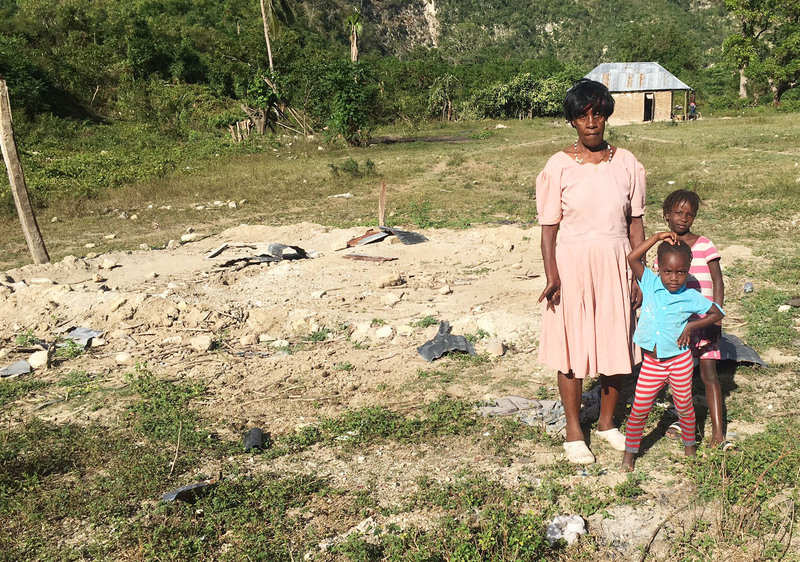 Out of 70 homes surveyed 30 homes had been completely destroyed by the hurricane and yet just four months latter half of the destroyed homes have been completely rebuilt. As I return home my challenge is to encourage those I met in poverty, to remember that I am truly blessed by the amenities of modern living and that God is also working in my life through the people of Bassin Cammin. I am beyond thankful for this opportunity and the support and prayers of all. I am excited to see how Haiti H2O continues to encourage the people of southern Haiti.